Promote carbon offsetting at an eco-friendly music festival? Check. Rock out to the Red Hot Chili Peppers live? Check. Tom Snogles is the founder and owner of Sun Power Lawn Care, a Gainesville, FL electric lawn care business dedicated to quiet and sustainable service. So I’ve had a pretty epic week. And that doesn’t even begin to describe it all. I was very lucky to be volunteering on behalf of We Are Neutral at Bonnaroo, the epic, eco-friendly music festival. 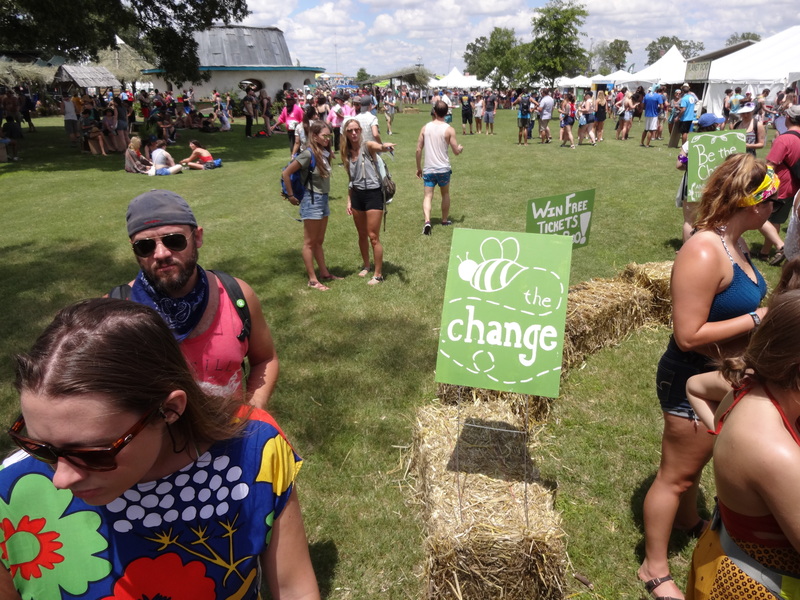 Major music festivals aren’t usually known for their sustainable efforts, but with We Are Neutral’s help, Bonnaroo is able to support both the environment and amazing music. We Are Neutral is a Gainesville-based nonprofit that helps businesses, organizations, individuals—and eco-friendly music festivals like Bonnaroo—reduce their carbon footprints by matching their emissions with carbon offsets. Those offsets support energy upgrades for low-income homes and tree plantings on conservation lands. Last year, Sun Power Lawn Care went carbon neutral with the help of We Are Neutral. As the owner of a carbon neutral business I was psyched for the opportunity to talk about offsetting with others at Bonnaroo. To me, it’s not just the big picture that’s important—these offsets also have direct, significant impacts for the individual families who receive energy upgrades for their homes, and the tree plantings support natural habitats for local wildlife. It was a honor to spread the word about carbon offsetting to festival goers, and so inspiring to see how many people loved the idea and jumped on board (a lot!). And, yeah, the music wasn’t bad either! Planet Roo is where the sustainable-minded Bonnaroovians come to hang out and learn about one another. We Are Neutral had a booth here all weekend alongside other green and socially conscious nonprofits. Aside from offsetting the emissions from Bonnaroo itself, We Are Neutral also provided offsets to individuals throughout the weekend. For $5 festival goers could offset the carbon produced from traveling to Bonnaroo, which a lot of people were really receptive to. The general reaction to our pitch was “oh, hell yeah.” To me, it was an incredible experience to see how excited people can get about green ideas like carbon offsetting—it gives me optimism for the health of our planet. After buying a carbon offset, people marked where they were coming from on the globe. It’s pretty cool to see what a wide impact We Are Neutral’s offsets have! One of the coolest things about the We Are Neutral booth was this canvas for ideas for a better world. I loved connecting with the people around me by reading their thoughts and opinions here. We collected a ton of visions from booth visitors on these boards, including clean air for every community, more peace and understanding, and free guacamole. Here’s to having it all. The best part of Bonnaroo was seeing how many people are looking to create positive change in the world. One single person—one single carbon offset—might not seem like a big deal. But take everyone’s efforts together, and the impact is enormous. As a sustainable business owner, this experience has motivated me to keep moving forward with Sun Power Lawn Care and to stay curious about how polluting industries can be changed for the better. This path has not been paved—but through hard work and collaboration with motivated, creative people like the team at We Are Neutral, we will pave it.